This recipe is super easy and somewhat of a deviation from the typical lemon-juice flavored seafood entree. Get ready to enjoy some unique flavors and impress your family without spending hours in the kitchen! Cook couscous according to package directions. The "pearl" version usually takes about 8 - 10 minutes to cook. In a small bowl combine the cumin, chili powder, coriander and a pinch of salt & pepper. Evenly rub the spice mixture on all sides of the fish and set aside (in the fridge if you’d like). Peel, core and dice the mango. We use a mango corer at our house. Chop the cilantro into small pieces. 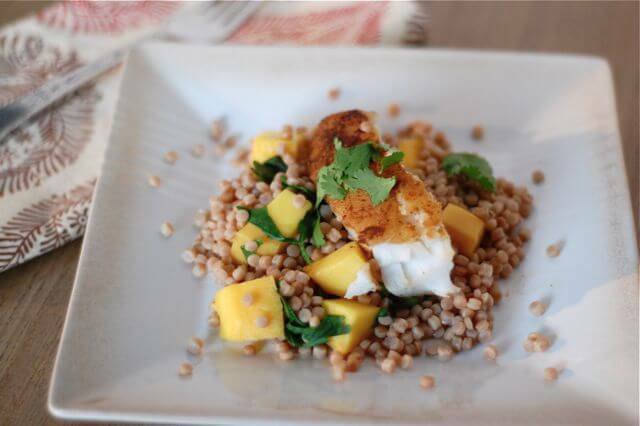 Put the mango, cilantro, and lime juice together in a medium-sized bowl and set aside. Heat the butter in a large sauté pan over medium heat. Add the seasoned fish to the pan and cook on both sides until it’s white all the way through. For thinner pieces this might only take a few minutes. 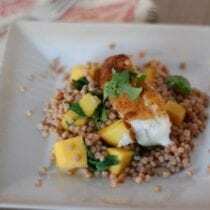 Once the couscous is done transfer it to the bowl with the mango, cilantro, and lime. Add ¼ teaspoon salt and mix together thoroughly. Divide the couscous mixture evenly among plates. Top with pieces of fish and extra pieces of cilantro. Serve warm with a salad or vegetable on the side and enjoy! Any suggestions for real food replacement for the butter? I can’t do dairy. Perhaps organic coconut oil? Coconut or olive oil would work great! Where do you buy the whole wheat pearl couscous? I prefer pearl, but have never seen a whole grain option. I got ours at Earth Fare…it was a small little plastic box-type package. If you live in an area that has a Kroger close by you can try there-I bought some of the quick variety couscous but they also had the whole wheat variety that takes longer to cook also. The recipe looks delicious. Just discovered your blog. I’m looking forward to reading more about your real food journey. Do you have a brand recommendation for whole grain pearl cous cous. I’m looking at brands that don’t say pearl, but are visibly different looking. Is it just a texture difference, or more than that? It’s basically the same thing just bigger pieces…the brand I found is “Rice Select” from Earth Fare. This was delicious! Thanks for a simple yet satisfying dinner. Made this tonight and…um…WOW. LOVED IT!!! I feel like I’m eating in a restaurant (aside from the mess I made in my kitchen)…OUTSTANDING!!!!!!! Do you have any suggestions if you cannot buy fresh fish? We live in a small town and the only “fresh” fish here is previously frozen, farm raised talapia or salmon??? And I feel like frozen fish is always mushy. I’d love any pointers you might have! Thanks! If my choices were fresh/farm raised or frozen/wild caught I would go with the frozen stuff. I’ve purchased fresh fish here and put it in the freezer myself and it defrosts very nicely so try to find the highest quality frozen stuff you can. Made this last night. It was wonderful,but I will add a little more chili powder next time. I liked the fish and loved the IDEA of the couscous. It turned out incredibly bland. I’m not even sure what I would do to improve it, but it definitely needed more flavor. Are you saying the fish or the couscous was bland? Did you follow the recipe exactly? the fish was good. I tolerate fish, I don’t particularly like it, but I actually had 2 servings of the fish. It was the couscous that was bland. No I didn’t follow the recipe exactly, I used 2 mangoes instead of 1. I made this for dinner last night and it was great. I used tilapia and it turned out perfect. I also added a bit more lime juice to the couscous to give it a bit more flavor. Thanks for the great recipe. Made this last night and it was great. I wasn’t really expecting to like it, but I had fish and mangos that needed to be eaten. It was amazing! Even my super-picky three year old ate the couscous. I made this for my family last week and they all LOVED IT!! My kids even requested it for their back to school family dinner! If you only knew how excited I was that they picked this over pizza!! I count that as a WIN in my book!! I have a question about Trader Joe’s Whole Wheat Cous Cous. I’m having a hard time deciphering if it’s a whole grain. The ingredient is Whole Durum Wheat Semolina…..whole food or no? I made this for my husband and 18mth old daughter. She isn’t a fish eater, yet, but she did devour the cous cous mixture. The entire dish is delicious and will definitely make it again! WOW! I made this for dinner last night and it was absolutely delicious! My husband was blown away! It is so easy to eat real food when it tastes this good! Thank you for all the recipes and ideas! Please keep them coming! Made this tonight with monkfish…really good! With thin fish you might need a little more rub. Thanks for the recipe! Was yummy. Used turbot and grilled. Added avocado to salsa – yummy!!! Delicious! We don’t eat a lot of white fish but this recipe will definitely be used again soon. I just stumbled upon your website yesterday. I think through a simple living blog? I made the Moroccan fish tonight and it was yummy! Thumbs up from my husband too. I used a thin white fish, already forgot the name, but it was fresh and wild caught in the US. The couscous was room temp by the time everything else was ready. Is it meant to be hot? Seemed just fine by me. Couldn’t find the pearl couscous in the grocery store so I just used regular whole wheat couscous. I do like the pearl variety when I can find it. Thanks so much for the recipe. We need to eat more fish! Do you think pearl barley would be an ok subsitute? I have a bag from your mushroom soup (amazing! Even my 16month old devoured it) and I’m not sure how else to use pearl barley. Thanks! I made this today and really enjoyed it! My bf did too. Awesome! I will be making this again. Last time I didn’t have couscous, so I used what I had – Bulgar (cooked per instructions) and it was yummy!